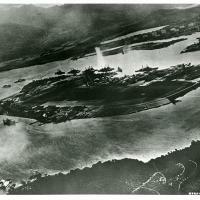 Japanese aircraft appeared in the air over Pearl Harbor just before 8:00 am on this Sunday morning. The color detail was on deck in anticipation of raising the flag at the stern at 8:00. 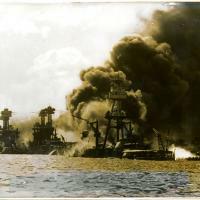 The Arizona came under attack almost immediately, and at about 8:10 received a hit by an 800-kilogram bomb just forward of turret two on the starboard side. Within a few seconds, the forward powder magazines exploded, gutting the forward part of the ship. 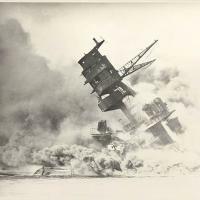 The foremast and forward superstructure collapsed forward into the void created by the explosion and turrets one and two, deprived of support, dropped more than 20 feet relative to their normal position. 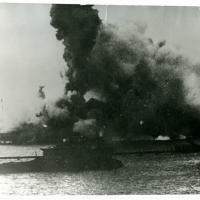 The explosion ignited furious fires in the forward part of the ship. 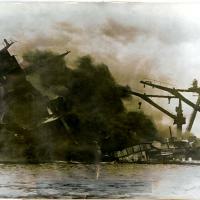 The majority of the crew members were either killed by the explosion and fire or were trapped by the rapid sinking of the ship. 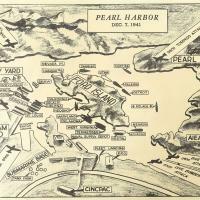 Many of the survivors displayed remarkable courage in assisting their shipmates to safety. 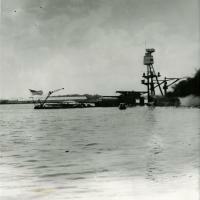 Lieutenant Commander Samuel G. Fuqua was awarded the Medal of Honor for his role in leading the rescue of other survivors. It was also awarded posthumously to Rear Admiral Isaac Kidd and Captain Franklin Van Valkenburgh. 1,177 of the crew died on the ship.